It’s a story that’s almost too crazy to be true. However as often is the case, reality is indeed stranger than fiction and the legend of Ben the Cudworth Lion endures in Cudworth today. 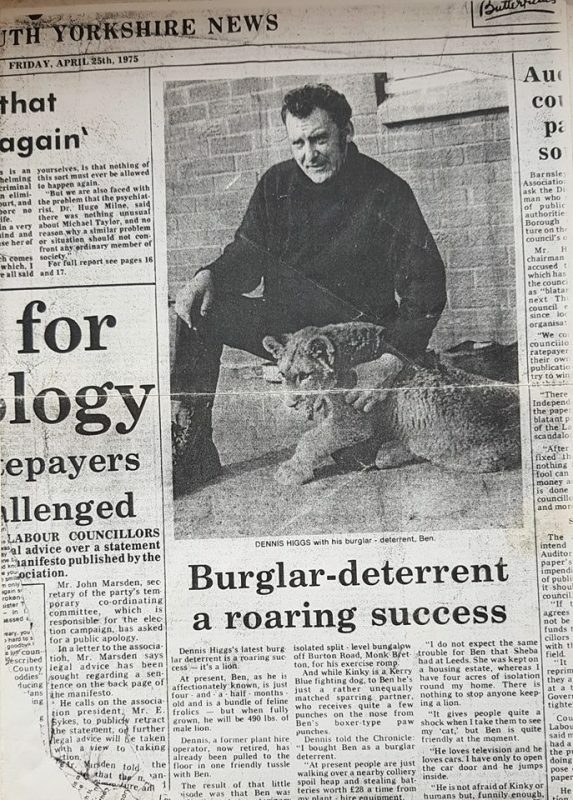 The not so tall tale of a lion kept in a scrap yard in Cudworth, Barnsley as a ‘guard dog’. Owned by Dennis Higgs, who was known locally as the Lion Man, a fascinating character who made a fortune dealing scrap metal. The lion was said to be kept in a compound near the main road and was brought as a burglar deterrent. One can only wonder if any ‘unlucky’ scoundrels ended up hunted down by Ben. “It gives people quite a shock, when I take them to see my ‘cat’ but Ben is quite friendly at the moment”. It was said you could hear Ben roar from miles away and that local children would dare each other to stroke him through the bars of his cage. It was a different time for sure but maybe a few Lions would keep the few local ruffians in check today. Not without its controversy, Ben become something of a local attraction, as people passed by on the bus to Barnsley Town Centre. “The scrapyard was owned by another character and local business man Dennis Higgs, he kept a lion he’d bought for two hundred and forty quid in the Exchange & Mart as a guard dog at the scrapyard and that was no rumour trust me”. By all accounts Mr Higgs is spoken of fondly in the area and the myth of the Cudworth Lion is remembered with a mix of wonder and disbelief. We recently shared a post of the Cudworth Village News Facebook page and had a great many comments…. To add another twist to the tale Dennis Higgs now in his 80’s was in the news recently as America’s latest oil baron after a ranch he’d purchased in Wyoming near the town of Cheyenne had struck oil. A larger than life legend for sure. What do you get if you cross a lion with a guard dog? I’ll get my coat and please remember to keep a watch out for any rouge Lions when looking for car parts in Cudworth.